A Jambone concert is always worth getting along to. It's a chance to gauge the development of the band and spot potential star performers of tomorrow. The weather had been rather unkind all day yet a good number made the effort to support Sage Gateshead's youth jazz orchestra. Seven pieces were in the programme; five compositions by Jambone's MD Paul Edis and the MD's arrangements of two well-known tunes. Edis' Sunny Blues - a world premiere, said Edis - introduced a number of soloists to the J's & B's audience; Jack Pearce, alto sax, Ferg Kilsby, trumpet, Sue Ferris*, baritone sax, Graham Hardy*, trumpet, and drummer Maeve Thorpe. The World is Never Still thought Edis, so, he wrote a tune about the matter. Vocalist Emily McDermott led off (think Norma Winstone) closely followed by Zak Parlby's tenor solo, flautist Megan Robinson (a senior member of the orchestra these days!) and fearless young trumpeter Ferg Kilsby. Lullaby of Birdland (arr. Edis) featured Emily's crystal clear singing, Zak and Ferg soloed once more with Maeve confidently handling an exchange of fours with the band's sections. Embrace the Silence (comp. Edis) challenged the young musicians and they coped remarkably well from the off; from bassist Alex Shipsey's bowed intro to the flutes of Megan and section partner Imogen Davies-Pugh through to further solos by Zak and Ferg. What 15 Feels Like is a companion piece to What 13 Feels Like. As MD Edis explained, the title alludes to the time signature and, perhaps, what it feels like to be 13, or, in this case, 15 and the teenage angst that goes with the territory. A tricky time signature perhaps, but, as Edis said, the idea was to challenge the Jamboners. During a residential weekend earlier in the year the band worked on the piece without the dots and this evening's performance in Fenham sparkled with a sense of freedom as first Haaruun Miller blew fearsome clarinet, Megan then ripping into it before guitarist Tom Henery cranked it up big style. We were yet to hear from Fabio de Sousa. Edis' When I Was Young was the trombonist's opportunity and he took it. He's been known to sit-in at jam sessions so, flanked by Sue Ferris to his left and Graham Hardy to his right, he wasn't about to be phased by the occasion and he wasn't. To close Jambone's set, something seasonal...We Three Kings. Graham Hardy blew, and, for the first time, pianist Edgar Ho, showed what he could do. This Saturday evening concert, facilitated by Sage Gateshead's Young Musicians Programme, should be considered a success every which way - young musicians gained performance experience (for some it was a debut performance! ), receiving applause for their efforts would be a boost to their confidence and, in sharing a platform with Hardy and Ferris, gain an insight to the everyday working life of the professional musician. 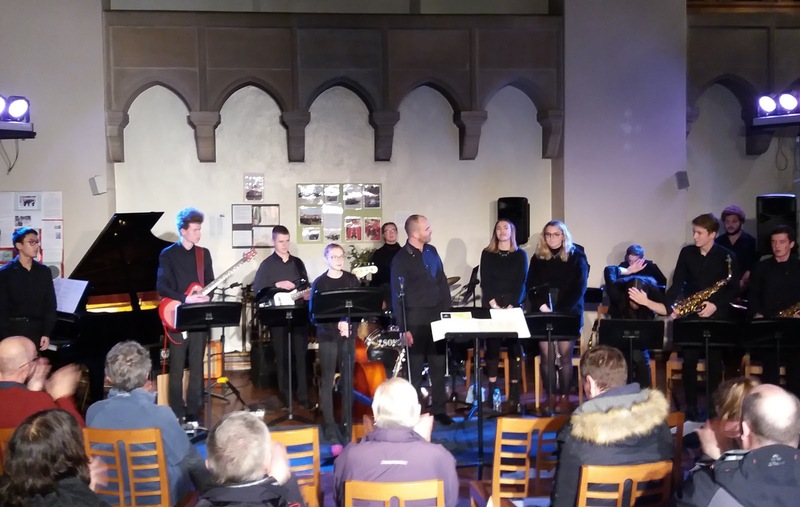 Jambone: Haarun Miller, Zak Parlby, Jack Pearce, Sue Ferris (reeds); Ferg Kilsby, Graham Hardy (trumpets); Fabio de Sousa (trombone); Imogen Davies-Pugh, Megan Robinson (flutes); Tom Henery (guitar); Edgar Ho (piano); Alex Shipsey (double bass/ bass guitar); Maeve Thorpe (drums); Emily McDermott (vocals); Paul Edis (MD). Earlier in the evening, Paul Edis sat at J's and B's Kawai piano to play Young at Heart. Jambone's MD invited Graham Hardy to join him in a spirited In Walked Bud followed by an Edis-Sue Ferris duo performance of Stardust. Ferris' extended baritone solo proved to be a major highlight. Finally, as a trio, Edis, Hardy and Ferris romped through St Thomas.